Although I should be enjoying the Fête Nationale du Québec, I just wanted to update the chart above. 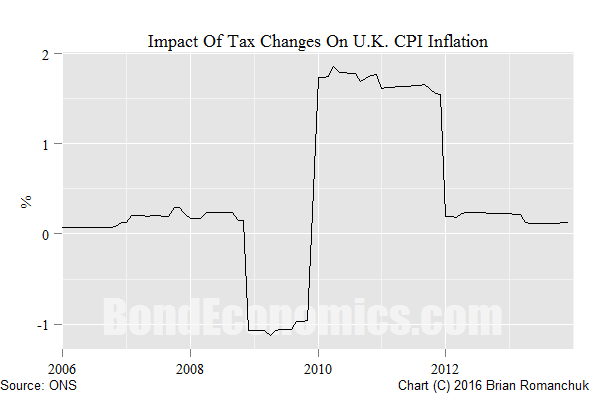 I first used it in this article, which discussed U.K. inflation. The point is that VAT changes can have a very large one-shot effect on inflation, and at an order of magnitude similar to the effect of currency changes. As noted by "Lord Keynes" here, one of the reasons to be concerned about Brexit is the potential for problems caused by a weaker exchange rate. Given the almost complete lack of effect of gyrations in the Canadian dollar on Canadian inflation, I have a bias to ignore these stories. In any event, a VAT cut would probably be enough to cancel the effect on consumer prices, and at the same time, acting as fiscal stimulus to counter-act the dampening effect of the referendum on "animal spirits." As I noted in my earlier article, one of the long-running complaints about the U.K. economy is the lack of dynamism in exports. Since I am supposed to be on holiday, I have no response to that issue at this time.